For much of the first week of May, countries engaged in the negotiations for formalizing the Regional Comprehensive Economic Partnership (RCEP) will meet in Singapore for their 22nd round of negotiations. The Singapore meeting is significant, for several participants in RCEP are keen to wrap up the negotiations quickly, especially since the negotiations have gone well beyond the original deadline of end-2015. In the recent weeks, Japan, Korea and China concluded their trilateral meeting on trade, with a message to recognize the importance of deepening regional economic cooperation and to realize the trade and investment liberalization and facilitation in East Asia through RCEP. China seems to be particularly intent in pushing RCEP towards its conclusion; perhaps President Trump’s recent warming towards the Trans-Pacific Partnership (TPP) is acting as a trigger for China to make that extra effort in RCEP and to its imprint on the mega-regional alliance. India is the only major economy seemingly distant from this talk of getting RCEP over the line. 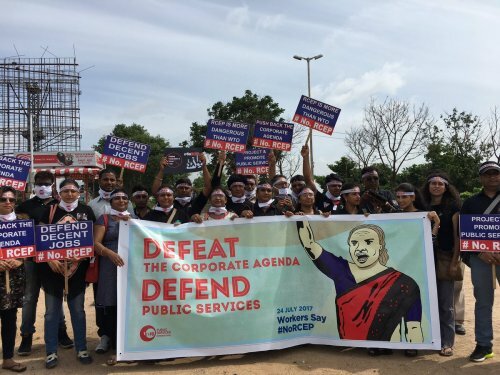 A reluctant participant from the very beginning, India finds that its own interests are almost entirely at a variance with that of the principal proponents of RCEP. India drew its own divergent line in the tariff negotiations, when most countries spoke of undertaking trade liberalization in both agricultural and industrial products. India’s major concern was the presence of China, and was therefore reluctant to offer lower tariffs on too many goods to its northern neighbour. The concern was not without basis: even without preferential tariffs, India’s imports from China had increased nearly 11-fold (from $7.1 billion to $76.2 billion) between 2004-05 and 2017-18. During the same period, increase in India’s exports to China was relatively modest, from $5.6 billion to $13.3 billion, resulting in steep increase in trade deficit vis-à-vis China, from $1.5 billion to $63 billion. Adding to this is India’s none-too-happy experience implementing the three FTAs with Asean, Japan and Korea. India had agreed to eliminate tariffs on about 80% of its products in each of these agreements and the outcome was quite similar—consistently rising trade deficits. The implementation of these agreements shows that while India lowered its tariffs to allow easier market access to its partner countries, Indian entities were unable to secure enhanced market access using the lower tariffs offered by the FTA partners. An official endorsement of the lack of gains from the FTAs with Asean, Japan and Korea came from the former foreign secretary S. Jaishankar, who had submitted before the Department-Related Parliamentary Standing Committee on Commerce that “a lot of our agreements have not served as well as they could have”. Ambassador Jaishankar had sounded a note of caution “about the manner in which such arrangements (FTAs) work out in respect of our imports as well as on our efforts to increase the share of manufacturing sector in our economy”. This assessment was entirely correct as successive governments have failed to make agriculture and manufacturing competitive. Since mid-2000s, each government undertook for reviving the manufacturing sector, starting with the National Manufacturing Strategy (2006), National Manufacturing Policy (2011), Make in India (2014) and the proposed industrial policy, but India’s manufacturing sector has, by and large, been unable to measure up to global competition. One way of looking at the state of the manufacturing sector is to analyse the trends in the manufacturing balance of trade. In 1991, there was a deficit of $3.4 billion, which remained below $10 billion until 2003. But once tariffs began to drop rapidly, the weaknesses of the individual sectors were crudely exposed. In 2016, the deficit had increased to nearly $80 billion. What is particularly disconcerting is that among the large manufacturing sectors, only four registered trade surpluses in 2016, namely, pharmaceuticals, textile and clothing, iron and steel products and automobiles. However, each of these industries has its own problems. Pharmaceutical industry depends on imported bulk drugs; textiles and clothing faces challenges in a subsidy-free environment as export subsidies have been challenged in the World Trade Organization (WTO); and iron and steel industry has been struggling of late. The automobile industry has been among the largest exporters, but it needs tariff protection to overcome its disadvantages, including several policy-induced ones, in order to be competitive. But RCEP negotiations, which are threatening to eliminate tariffs on 90-92% of the tariff lines, may pose existential challenges to sectors like the automobiles. In 1997, India joined the Information Technology agreement of the WTO and eliminated tariffs on electronic goods, dealing a fatal blow to the fledgling domestic industry. Two decades later, the government should desist from walking down the same path, allowing RCEP to hollow out the manufacturing sector. What it should do instead is to negotiate the policy space that is imperative for supporting the turnaround of domestic manufacturing.